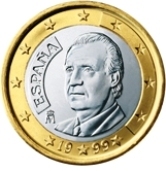 Spain was one of the founding members of the Euro zone and started issuing coins in 2002. 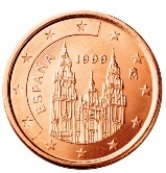 Some basic facts relating to Spain. 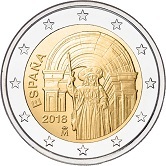 Spanish Euro Coins have many interesting features, including the "Raised Arc" feature of the early coins and the "Cultural Heritage" Commemorative Series. 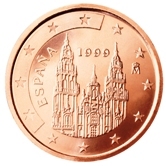 As with many other countries in the Euro zone , Spainish Euro Coins are devided into three groups - one for the "copper coloured coins"(1 cent,2 cent and 5 cent), one for the "gold coloured coins" (10 cent,20 cent and 50 cent) and finally one for the one Euro and two Euro coins. 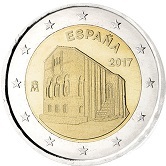 The first motif (1,2 and 5 cent coins) is the Cathedral of Santiago de Compostela which contains the grave of the Apostle Jacob. 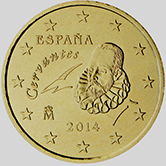 The second motif (10,20 and 50 cent coins) is Miguel de Cervantes the most renowned Spanish literary figure - author of Don Quixote. 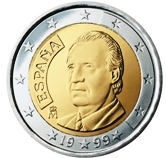 The third motif (1 and 2 Euro coins) is reigning monarch Juan Carlos I. 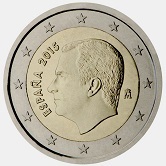 The design of the Spanish coins was slightly modified in 2010 to bring them in line with the new guidelines. Previously some of the "* "(stars) were embedded in a sort of raised arc. 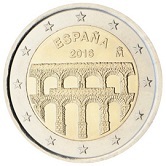 On the 1 Euro and 2 Euro coins name "Espana" was also on a raised arc. These raised arcs have been removed and the stars now appear as in the European flag. 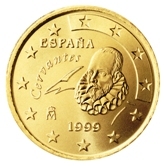 The year which previously appeared under the king and was in the "star arc" now appears to the left of the king in the inner disc. 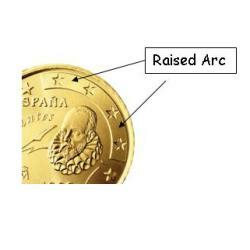 The raised arc appeared from 8 o'clock to 12 o'clock in the 1,2 and 5 cent coins. 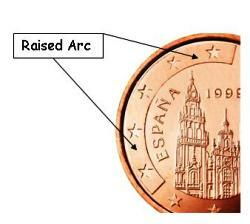 The raised arc appeared from 12 o'clock to 3 o'clock in the 10,20 and 50 cent coins. 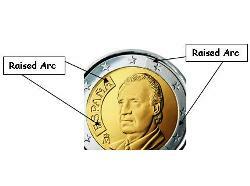 The raised arc appeared from 1 o'clock to 4 o'clock in the 1 Euro and 2 Euro. 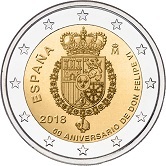 In addition the raised arc on which "Espana" was imprinted has been removed. 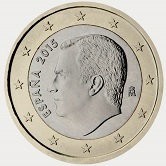 New positioning of date as from 2010. 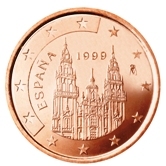 The one, two and three cent coins have as their motif - Cathedral de Compostela. 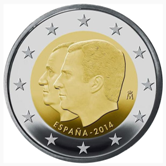 The one and two Euro coins have as their motif the head of the reigning monarch - until 2013 Juan Carlos I and from 2014 Felipe VI. 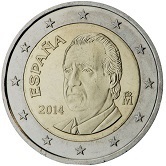 As from 2010 all the raised arcs were removed and in addition in the one and two Euro coins the mint mark was moved from between seven and eight o'clock to between three and four o'clock and the year of issue was taken from the outer ring and placed at eight o'clock in the inner circle. 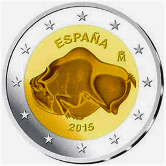 This repeated six times so that the "12-Star" European motif is represented. 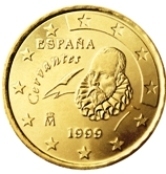 Each "2" is inverted with respect to the preceding and following "2". 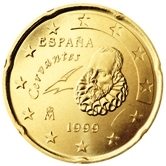 Spanish Commemorative Two Euro coins. 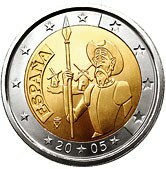 2005 - Depicted is the legendary Don Quixote, one of the most famous characters in literature together with two of the windmills (giants) he charged. 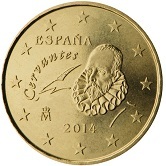 Commemorated is the 400th anniversary of the publication of Don Quixote. 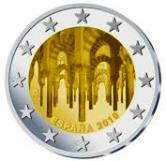 2010 - The Mezquita (Mosque) and old town of Cordoba are depicted. 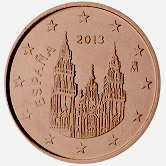 This is the first coin in the Spanish World Heritage Series. 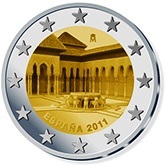 2011 - The Patio de los Leones (Court of the lions) in the Alhambra in Grenada is depicted. 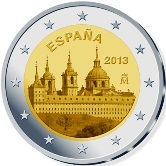 2013 - This fourth coin in the Spanish world heritage series represents the San Lorenzo del Escorial Monastery. 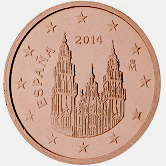 2014 - This fifth coin in the Spanish world heritage series. 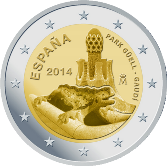 Park Güell is represented by a lizard sculpture and a detail of one of the pavilions. 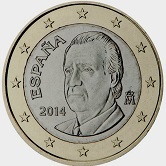 2014 - Succession to the Throne of King Filipe VI. 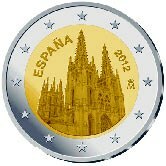 2018 - Old Town of Santiago de Compestela now a UNESCO World Heritage Site. 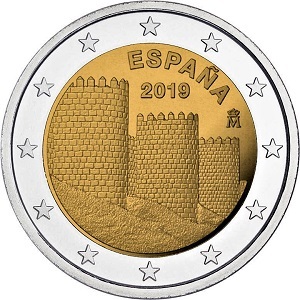 2019 - Commemorated with this coin is the construction of city wall of Ávila. 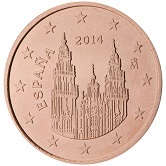 Return from Spanish Euro Coins to Links to Specific Countries. 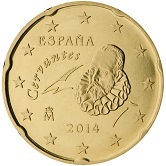 Return from Spanish Euro Coins to euro coin collector.